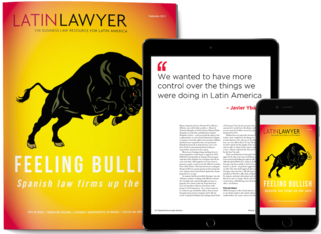 Colonial ties mean Spanish and Portuguese influences are ubiquitous across Latin America, and the legal market is no exception. But in recent years, Iberian firms that have long had a stake in the region have worked hard to strengthen their position, investing time and money in building a regional network that will stand the test of time. We profiled the Iberian firms making their mark in Latin America and found that while Iberia’s three major firms – Uría Menéndez, Garrigues and Cuatrecasas – share the same end goal when it comes to carving a healthy slice of the market, they have opted for varying strategies to achieve their objectives. By avoiding opening offices in Latin America, smaller Spanish firms are taking a different approach entirely, although they are no less committed to picking up work in the region. Much of the focus for outsiders looking into Latin America has been on the Pacific Alliance trade bloc, whose four founding members together comprise the eighth-largest economy in the world. Philippi Prietocarrizosa Ferrero DU & Uría has opted to mimic the bloc’s cross-border structure and so far counts offices in Chile, Colombia and – most recently – Peru. In this edition we take a look at its entry into Peru, which entailed a merger with two local outfits. There are other encroachers on the Latin American legal market today. Auditing companies such as the Big Four have made it their mission to expand into legal services. Now, law firms are expanding their own remits. We talk to the growing number of firms providing transfer pricing services, as they bid to pick up work stemming from global initiatives to crack down on tax avoidance strategies. Also in this edition, with the country’s economic and political crisis showing no sign of ending, we get an update from managing partners in Venezuela. We hear from an associate at Colombia’s Gómez-Pinzón Zuleta Abogados about life at the beginning of the career ladder and lawyers from Brazil’s Levy & Salomão Advogados tell us why competing enforcers mean the country’s anti-corruption leniency programme is not working how it should be.